Abstract: The Mura Depression is located at the SW border of the Pannonian Basin in the transition zone to the Eastern Alps. The Periadriatic Lineament, Labot, Ljutomer and Raba faults govern its structural characteristics. Ridges trending in the NEE–SWW direction divide the depression into three sub-basins. Therefore, the thickness of Miocene to Quaternary sediments varies considerably. The greatest depth to the Paleozoic metamorphic rocks is over 5500 m in the Ptuj-Ljutomer synform. The structure of the pre-Tertiary basement is well resolved by seismic reflection, gravity and magnetic investigations, as well as by drilling for hydrocarbons and thermal water exploration. The main tectonic units of the Mura Depression were correlated by using geophysical data to the structures outcropping at its western and southern rims. A compiled structural map of the pre-Tertiary basement is presented and geophysical and structural characteristics of main geotectonic units discussed. Beside minor production of oil and gas, the Mura Depression is an important geothermal area. Some locations were also explored as promising for the construction of an underground gas storage facility in aquifers. Abstract: Limestone samples from three incomplete stratigraphic sections of the Upper Devonian Ayineburnu Formation in the Denizliköyü area, Gebze, northwestern Turkey produced conodont faunas, which can be correlated with established Famennian conodont zones. The sections (D, DN and DB) consist mainly of interbedded planar to nodular limestones and dark shales, indicative of slope sedimentation. The sections D and DN define an interval extending from the Lower marginifera Zone into the postera Zone, and fill the gap between the former studied sections of the Ayineburnu Formation. The section DB contains the Lower and Middle expansa Zones. Abstract: The Middle Jurassic (uppermost Bajocian–lower Bathonian to upper Bathonian–lower Callovian) radiolarian cherts in the Medvednica Mt (NW Croatia) have a high content of SiO2 (average 90.87 %). Most of the silica is of biogenic origin as is indicated by a high Si/Si+Al+Fe+Ca ratio (0.83–0.97). The Al/Al+Fe+Mn ratio (average 0.59) and relatively low contents of Fe and Mn suggest that the sedimentation of the radiolarian cherts was not influenced by hydrothermal volcanisms. The high correlation coefficient between the lithophile elements Ti, K, Al, Th, Zr, Hf and Rb implies that the detrital component in radiolarian cherts for the most part has a terrigenous provenance. The MnO/TiO2 ratio and Lan/Cen vs. Al2O3/(Al2O3+Fe2O3) diagram show that the investigated cherts were derived from two different, but not necessarily strongly separated, sedimentation areas: (1) continental shelf and slope or marginal sea, and (2) deep ocean floor, trench or basaltic plateau. According to the proposed sedimentation model the radiolarian cherts in the Medvednica Mt were deposited in a relatively narrow basin. The detrital material was derived from two source areas: (1) from a continent (terrigenous input) and (2) from an accretionary wedge (undifferentiated magmatic arc-like input). During the Late Jurassic–Early Cretaceous the radiolarian cherts were incorporated into the tectonic melange (accretionary prism) along with other fragments: Triassic radiolarian cherts and carbonate rocks; Jurassic shales, siltites and sandstones and basic and ultrabasic magmatic rocks. Abstract: The palynomorph associations of the Upper Cretaceous dinosaur-bearing sediments of three different sites (Pui, Totesti-baraj and Nălaţ-Vad) within the Haţeg Basin show a great similarity with the palynomorph associations of the stratotypes of the Densus-Ciula and Sânpetru Formations. The absence of volcanoclastic layers places the sediments within the Sânpetru Formation. Palynological evidence indicates a Maastrichtian age of the vertebrate sites studied. The age can be refined to the Early-Late Maastrichtian boundary interval based on the good correlation with the lower Rogancian (France), the lower Garumnian (Spain) and the Gulpen Formation (Maastrichtian stratotype, The Netherlands). The ancient vegetation, dominated by ferns and bryophytes with disperse flowering plants and gymnosperm trees, is indicative for a subtropical climate. Freshwater ferns flourished in the floodplain ponds. For the first time, the megaspore genus Ghoshispora is recorded in Europe. Abstract: Costatheca and Spermatites are recorded from the Maastrichtian Deccan Intertrappean Beds of Mohgaon-Kalan and Padwar, Madhya Pradesh, India. These forms are found in association with typical Late Maastrichtian palynological species of aquatic pteridophytic sporomorphs namely, Azolla cretacea, Ariadnaesporites sp., Gabonisporites vigourouxii and angiospermic pollen Aquilapollenites bengalensis. Specimens of Spermatites are compared with the megasporangium of Azolla pinnata. It is observed that the indusium of A. pinnata resembles Spermatites in shape, size and ornamentation. The views of other scientists regarding the affinity of Costatheca and Spermatites have also been discussed. Abstract: Palynological investigations of the deep-marine Upper Eocene–Lower Oligocene, mainly turbiditic and hemipelagic sediments exposed at Folusz (Siary Zone of Magura Nappe, Polish part of the Western Carpathians), revealed a prevalence of land plant remains in the palynofacies. Dinoflagellate cysts are the most frequent among marine palynomorphs. A Priabonian age is found in the lower part of the Szymbark Shale; a Rupelian age is determined for the investigated part of the Magura Beds. Dinoflagellate cyst distribution shows no major changes, contrary to an outstanding change recorded in the coeval sediments from other parts of the Polish Carpathians. This implies different paleoenvironmental conditions in the northern part of the Magura Basin during the latest Eocene and Early Oligocene. Occurrence of high-latitude dinoflagellate cysts in the lowermost part of the section may be related to a drop of temperature in the surface waters of the sedimentary basin during the Late Eocene. Dinoflagellate cysts, whose motile stages are thought to have inhabited near-shore waters, are frequent in turbidites, whereas the hemipelagic/pelagic sediments usually contain more numerous oceanic specimens. Recycled dinoflagellate cysts occur more frequently in turbidite sediments. Abstract: Anchimonomineralic fluorite vein mineralization was studied at six sites within the Proterozoic crystalline basement of the Brunovistulicum. The mineral composition is very simple, represented mainly by fluorite, locally accompanied by quartz and calcite. Fluid inclusion study shows that the parent fluids were low-saline (0–4.3 wt. % NaCl equiv. ), low-temperature (homogenization temperatures 72–183 °C) aqueous solutions. The REE data indicate strong interaction of the fluids with host rocks. Stable isotope analyses reveal both variable oxygen isotope composition and an apparent admixture of the oxidized organic carbon in the parent fluids. The formation conditions can be easily compared with those characterizing the Neoidic (Tertiary-Quaternary) fluorite mineralization described from the North Bohemia region. The source of the fluid can be found in formation waters of the southeastern margin of the Bohemian Massif covered by the Carpathian Foredeep, Vienna Basin and Carpathian flysch nappes, which actually exhibit very similar geochemical signatures to the fluorite-precipitating fluids. 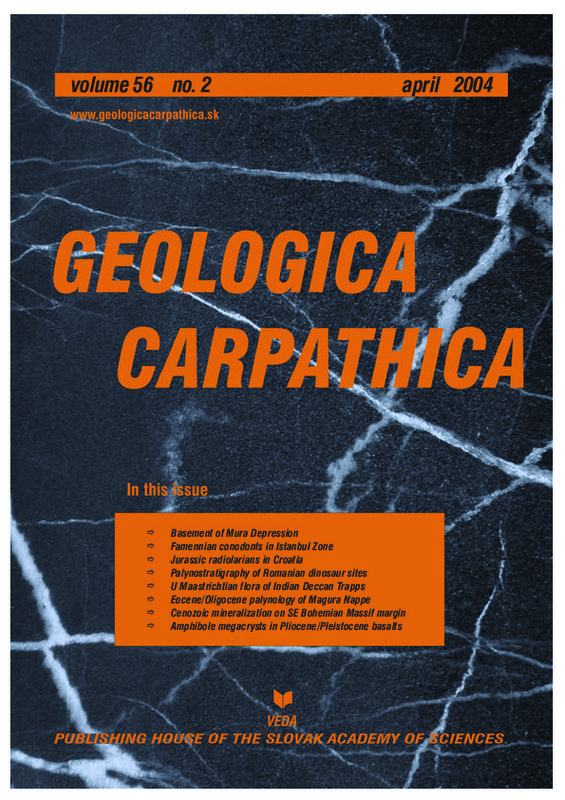 Abstract: Major and trace element compositions, stable H and O isotope compositions and Fe3+ contents of amphibole megacrysts of Pliocene-Pleistocene alkaline basalts have been investigated to obtain information on the origin of mantle fluids beneath the Carpathian-Pannonian region. The megacrysts have been regarded as igneous cumulates formed in the mantle and brought to the surface by the basaltic magma. The studied amphiboles have oxygen isotope compositions (5.4±0.2 ‰, 1 σ), supporting their primary mantle origin. Even within the small δ18O variation observed, correlations with major and trace elements are detected. The negative δ18O-MgO and the positive δ18O-La/Sm(N) correlations are interpreted to have resulted from varying degrees of partial melting. The halogen (F, Cl) contents are very low (<0.1 wt. %), however, a firm negative (F+Cl)-MgO correlation (R2 = 0.84) can be related to the Mg-Cl avoidance in the amphibole structure. The relationships between water contents, H isotope compositions and Fe3+ contents of the amphibole megacrysts revealed degassing. Selected undegassed amphibole megacrysts show a wide δD range from –80 to –20 ‰. The low δD value is characteristic of the normal mantle, whereas the high δD values may indicate the influence of fluids released from subducted oceanic crust. The chemical and isotopic evidence collectively suggest that formation of the amphibole megacrysts is related to fluid metasomatism, whereas direct melt addition is insignificant.